An iPhone 8 rests on some furniture. The furniture is a yellow chair or sofa that appears soft. The phone is close to the edge but not in immediate danger of falling off. The furniture takes up the left three-fourths of the images. The remaining one-fourth is tile flooring. The tiles are blue with stars in two corners. Six tiles are visible in part or whole. 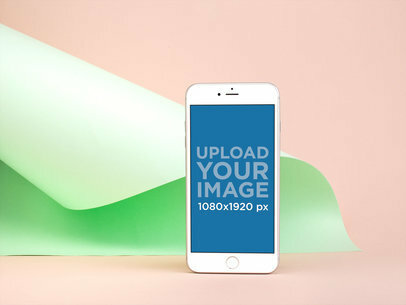 Use this iPhone 8 Mockup to visualize your image on a device. 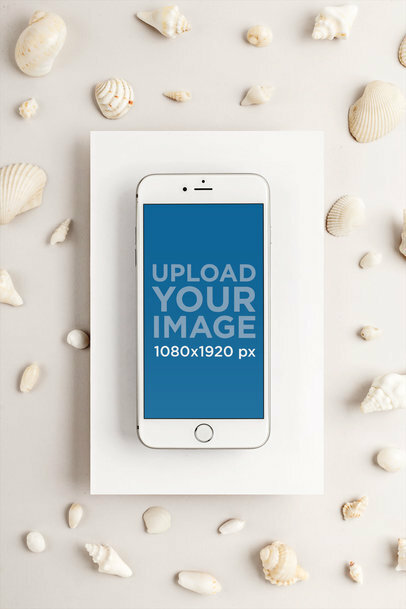 You can edit your background color, and perfectly create an awesome visual for your image or design. 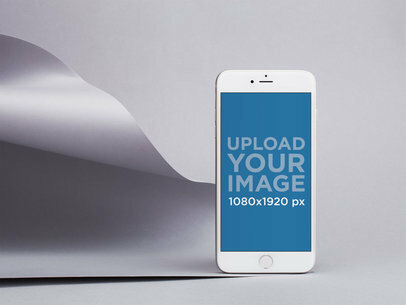 Our mockups are stress-free and easy to use. Try them out! 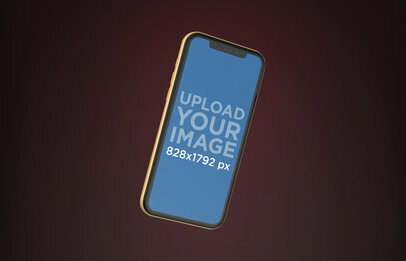 The image displays a Gold iPhone 8 Plus, the focus is on the phone, someone is holding it, and the rest is a blurred background. 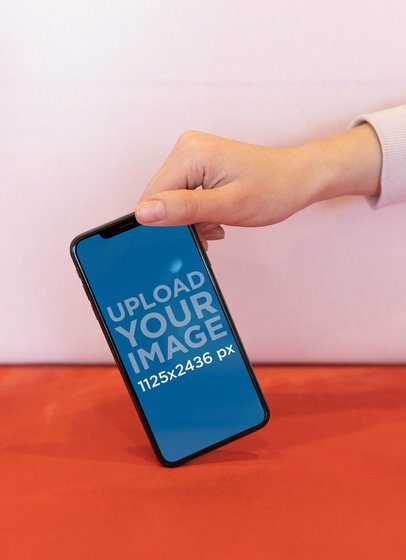 The person holding the phone is a male. A yellow background with a green bottom section that runs diagonally across the bottom portion. On top of the yellow background lies a branch from a palm tree. 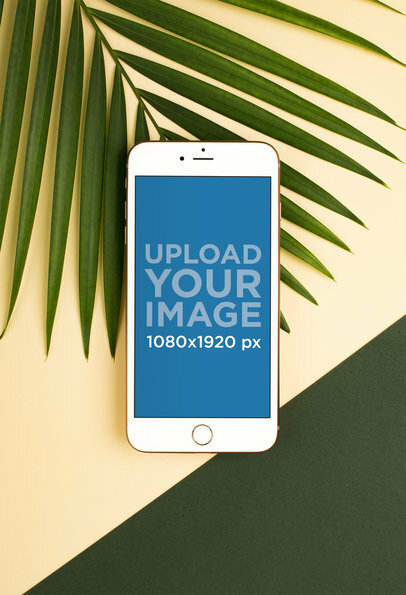 On top of the palm tree branch is a perfectly centered Gold iPhone 8 Plus. 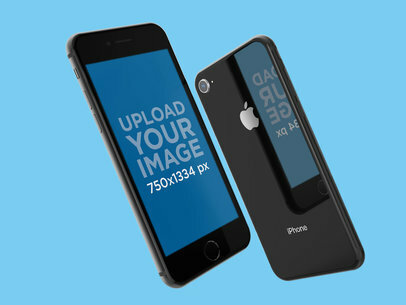 The image displays a black iPhone with a blue background on it. The iPhone is standing straight up and is underneath a light pink folded piece of cardboard. The cardboard is folded in a way that is a cylinder shape with a corner of it touching the table. The surface the phone is one is a light tan color. There is a Space Gray iPhone 8 Plus standing in portrait position. 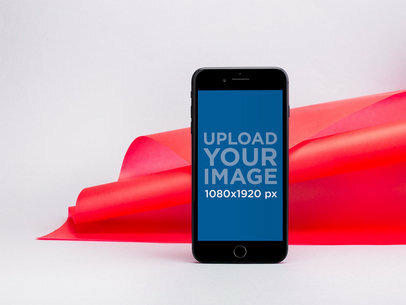 There is a pink background with a light purple cardboard coming from the top left corner and finishing slightly behind the iPhone. 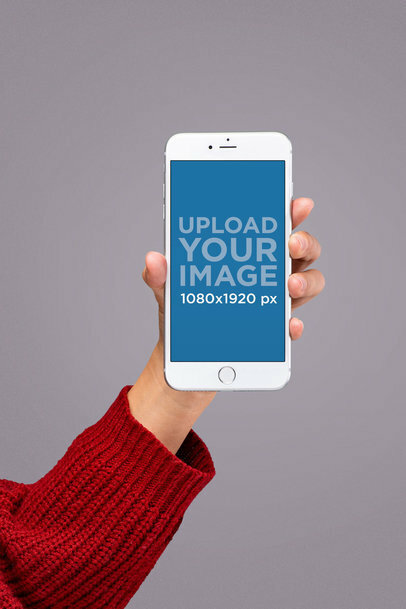 A woman is holding an iPhone 8 in her left hand. 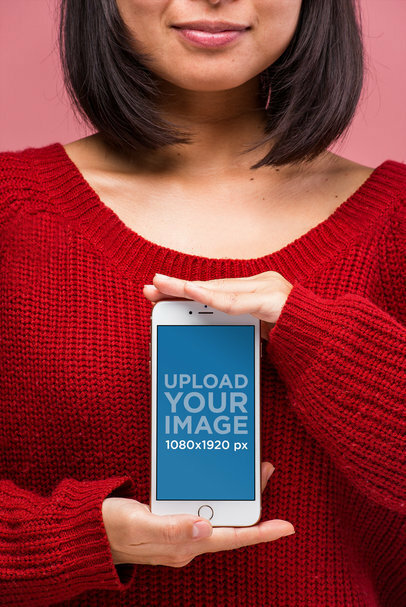 The iPhone is held in portrait orientation in front of her chest and right shoulder. 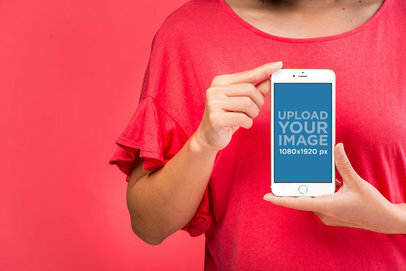 The iPhone is resting between her thumb and index finger. The female model is wearing a striped t-shirt with a V neck. She has dark brown hair that is shoulder length. She is standing in front of a plain blue wall. 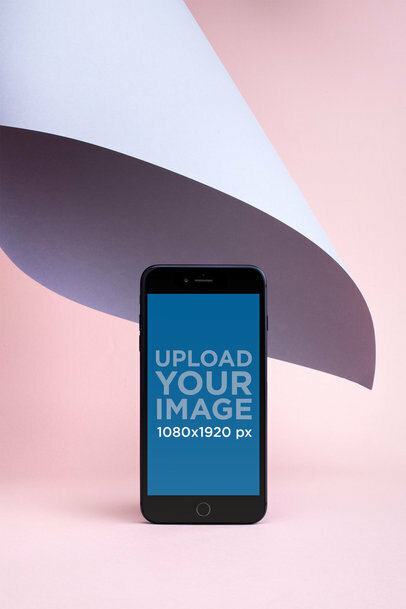 The image displays an iPhone 8 Plus sitting in front of a black cardboard that is spiraled over. 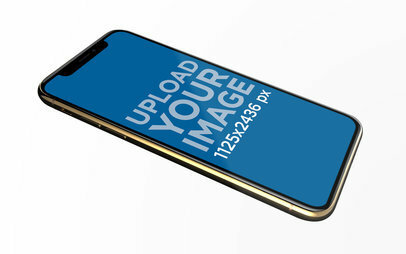 The iPhone is standing in portrait position and is facing the camera. 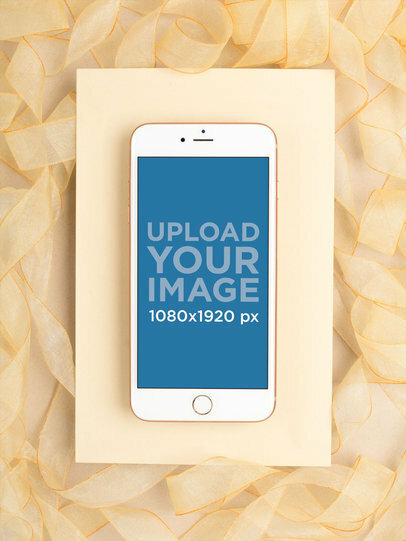 Both the iPhone and the cardboard sheet are against a gray background. 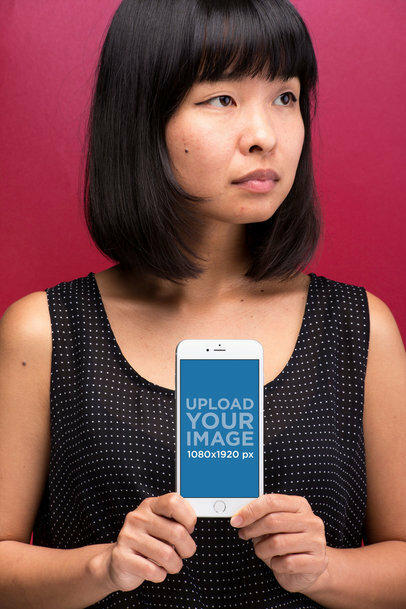 An Asian woman is holding an iPhone 8 Plus in front of her chest against a red background. 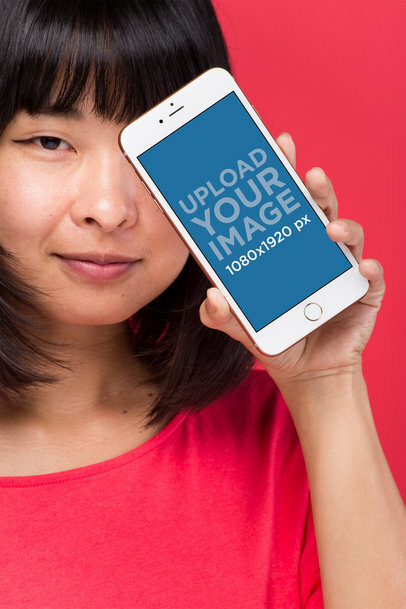 The iPhone is standing in portrait orientation with the screen facing outward. The woman has black shoulder length hair with bangs. She is wearing a sleeveless shirt with polka dots. The model is looking off to the side and has a serious expression on her face. She is wearing winged eyeliner. 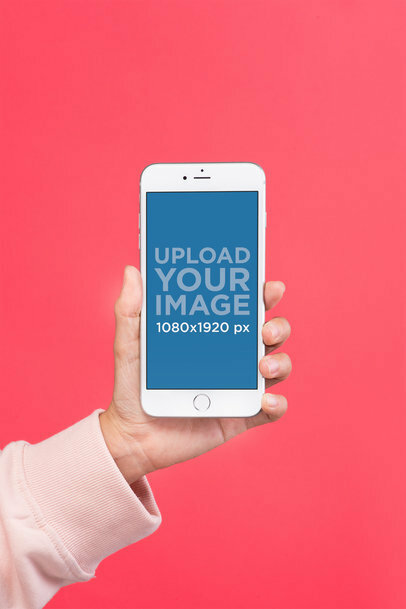 A woman is holding an iPhone 8 Plus in her hand. The iPhone has a blue screen. She is holding the phone with her right arm. The woman has a white tank top with black dots. She has black hair and a neutral expression. 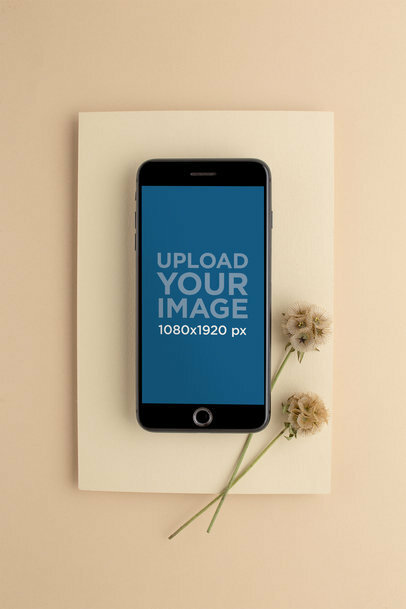 An iPhone 8 plus sits upright in the portrait position on a multi-colored gray background. 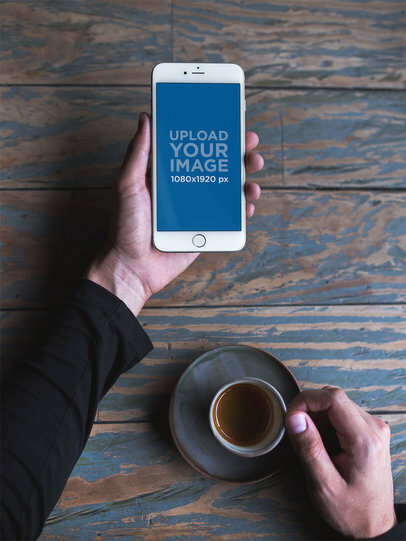 The screen is blue and the device has a round button. 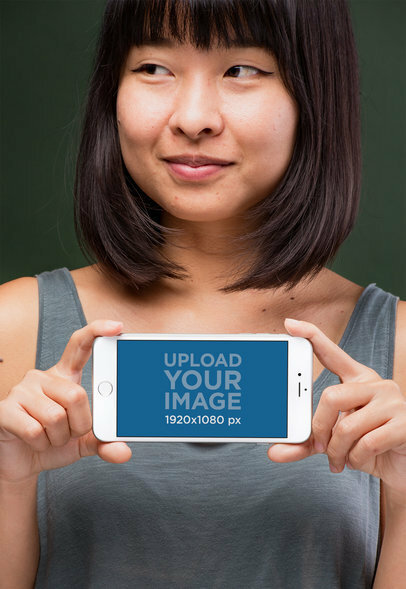 An Asian woman with shoulder-length dark hair is smiling and holding up an iPhone 8 Plus directly at the camera. 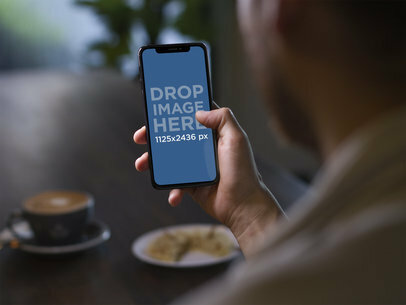 The iPhone has a black bezel, is fully visible, and is tilted at a slight angle as she holds it in both hands. The female model is wearing a sleeveless white shirt with black polka dots, and she is standing in front of a bright orange background. 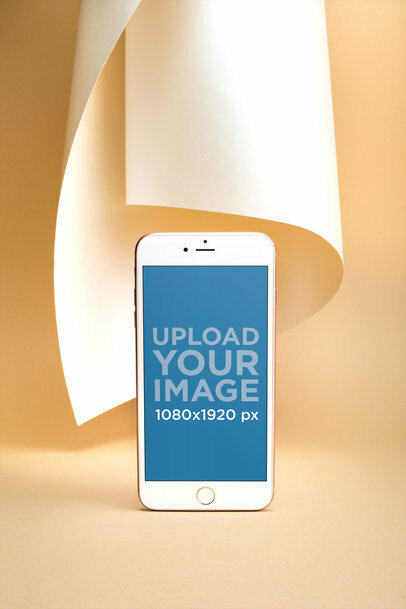 A Gold iPhone 8 is standing straight up in portrait position on a light tan table. There is a white piece of paper that is partially folded in a cylinder shape with one corner almost touching the table. 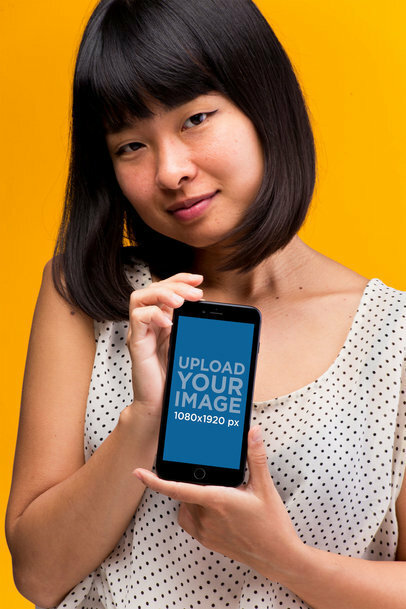 An Asian woman with short brown hair is wearing a striped shirt while holding a white iPhone 8 in her left hand with the screen facing towards the camera. Her arms are crossed as she holds the phone. She is looking off to her right with a despondent and somewhat upset look. 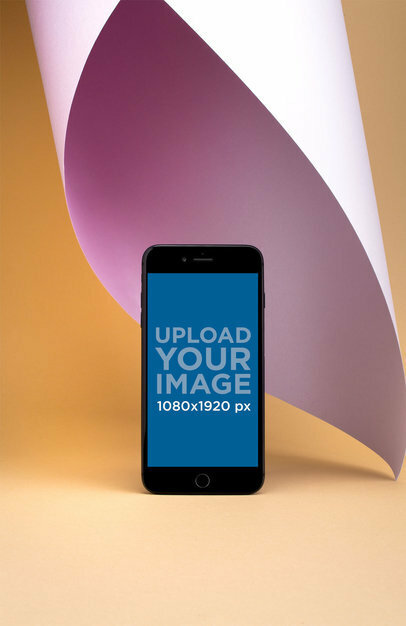 An iPhone 8 Plus is standing upright in front of a light-green piece of paper. The piece of paper is folded and rolled over on itself. 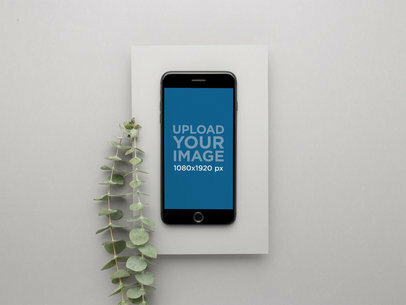 The iPhone is positioned in portrait orientation and is screen side forward. 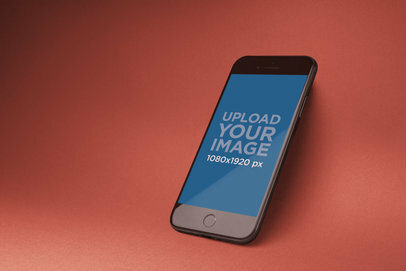 The iPhone is sitting on a plain colored surface. 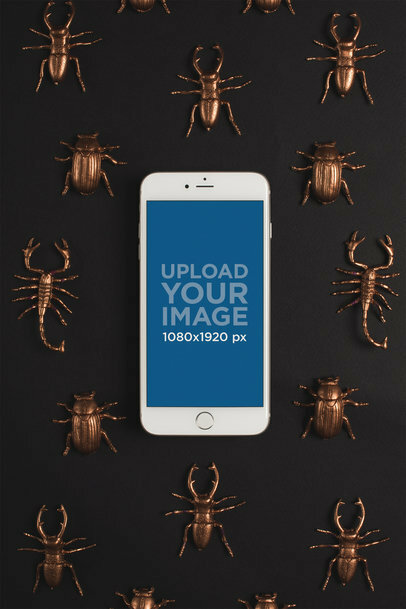 The image displays a black background with gold/metallic beetles and scorpions scattered across it. In the middle is a tan piece of paper. 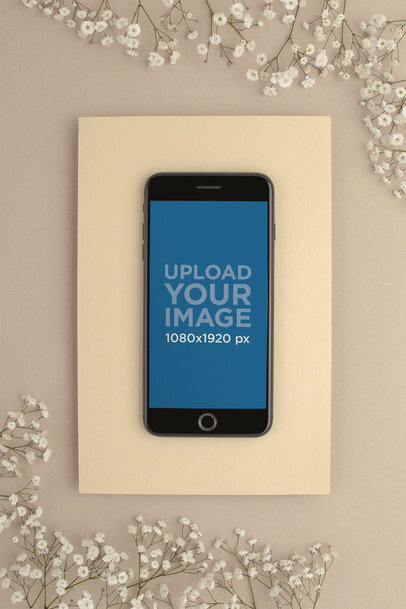 Centered and on top of the paper is an iPhone 8. 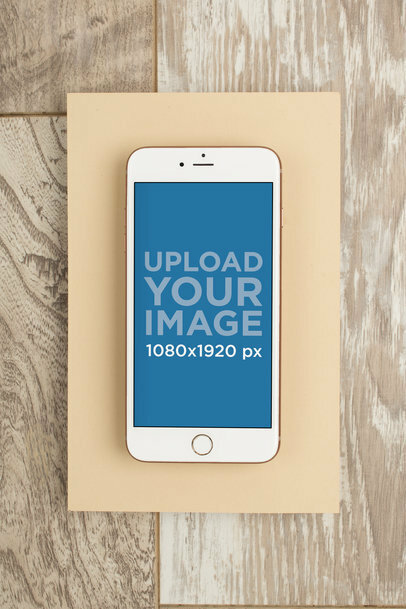 A woman with shoulder-length brown hair in a white polka dot t-shirt that rests just below her collarbone is holding an iPhone 8 straightforward with one hand on the top left corner and the other on the bottom right corner of the phone. 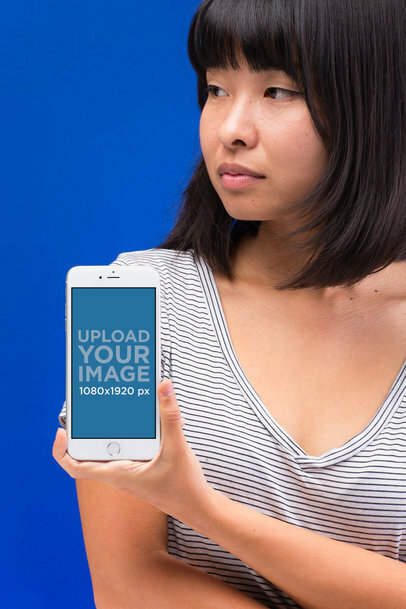 A woman is holding a Space Gray iPhone 8 in portrait position. The woman is white, has shoulder-length black hair and is wearing a gray sweater. We only see her face below her nose. 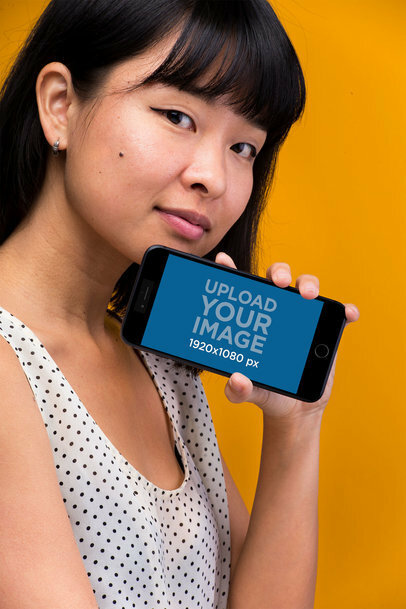 An Asian woman with dark hair is standing in front of a plain background and holding up an iPhone 8 Plus in her left hand. The phone has a white bezel, the front fully visible, and tilted at about a 30-degree angle. The woman is wearing a solid pink hoodie with the hood up, and smiling very slightly with a closed mouth. 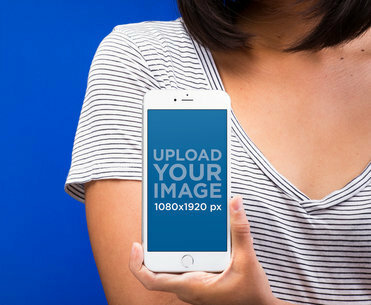 A woman is shown holding an iPhone 8. 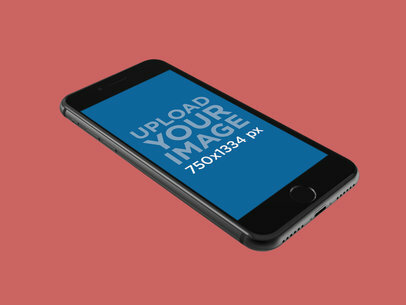 The iPhone's display reads "UPLOAD YOUR IMAGE 1080x1920 px" in large print. Only the woman's torso, arms, and hands are shown. 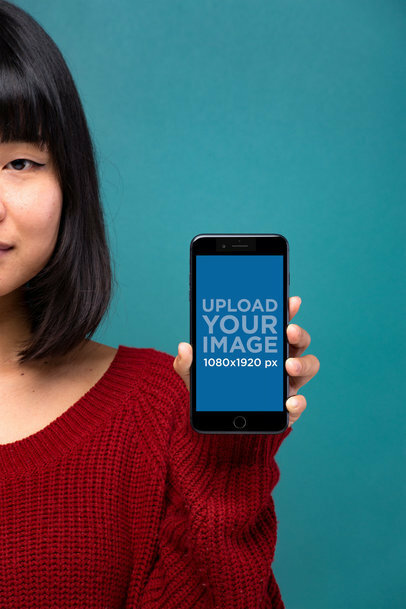 The is gingerly holding the phone between the index fingers of each hand in front of her..
A right arm reaching in from the left side of the frame is holding onto an iPhone 8 Plus with a white faceplate. 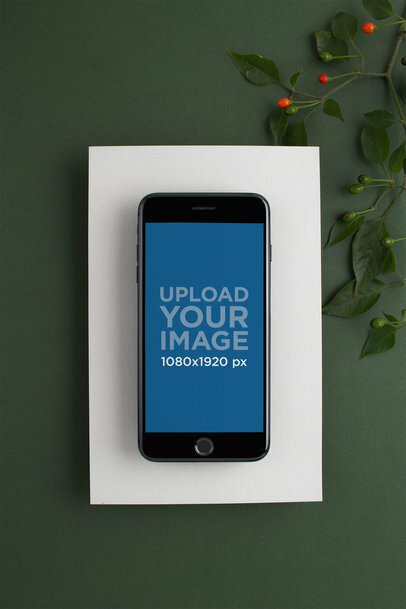 The iPhone 8 Plus is angled toward the right top corner of the image. There is a black sleeve on the forearm pulled slightly back from the wrist. The background is solid and plain. A Space Gray iPhone 8 Plus is being held by a woman. The iPhone has a blue background. The woman is wearing a red sweatshirt and has black hair. A Space Gray iPhone 8 is standing straight up. The black-colored smartphone has a blue screen. There is a folded up sheet behind the iPhone. 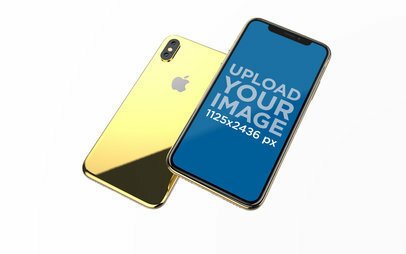 A gold iPhone 8, with white glass around the LCD screen, sits on top of a brown piece of rectangular paper. The rectangular paper and iPhone 8 are sitting on top of some gold and brown ribbons as well that are laying on a table. 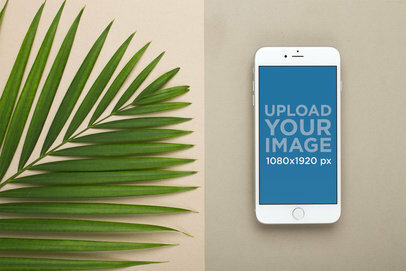 A green plant with many leaves sits next to a phone. The leaves of the plant are long and thin. They look as sharp as knives. 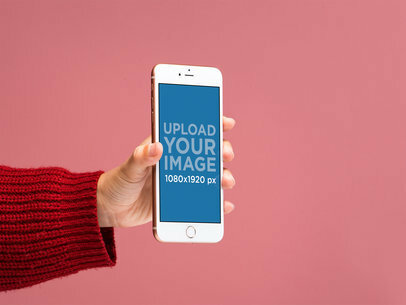 A person is holding an iPhone in front of a pink background. You only see the hand of the person holding it. The hand looks small and belongs to a Caucasian. The owner of the hand is also wearing a long-sleeved, pink sweater. It's an iPhone 8 Plus and has a white bezel. The background is completely pink. An Asian woman with dark brown shoulder-length hair is smiling and looking to her right. Her straight hair wraps around her face. 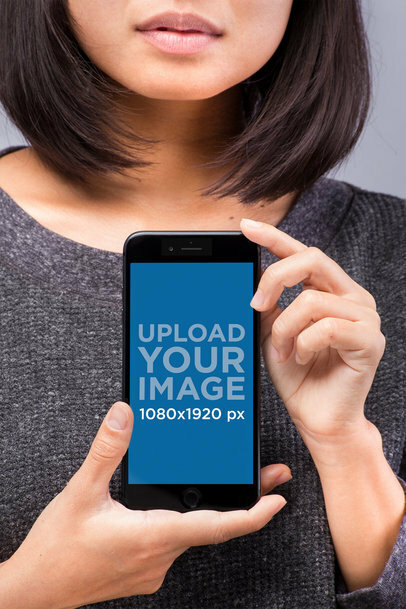 In between her thumbs and forefingers is an iPhone 8 Plus being held in the horizontal position. She has short nails without any fingernail polish. Above her shoulders a dark green background is visible. She is wearing a gray tank top. 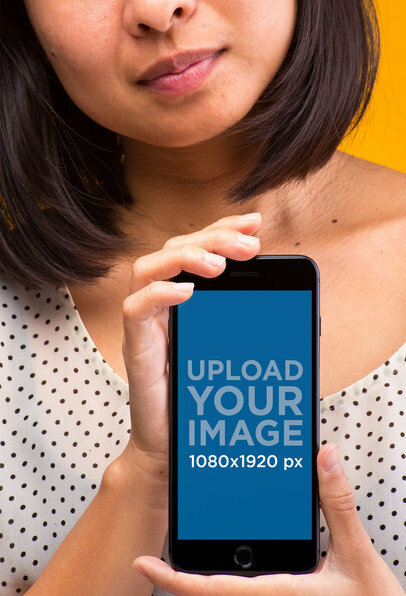 An iPhone 8 Plus is being held by a woman. 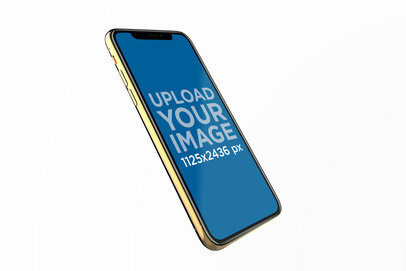 The iPhone has a blue background. The smartphone is tilted to the left. The woman is wearing a red shirt. A Space Gray iPhone 8 Plus is being held by a woman. 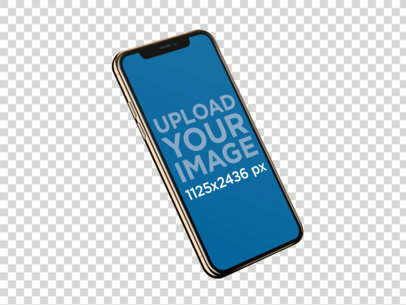 The iPhone has a blue background and is being tilted to the right. The woman is wearing a patterned sweatshirt. She has her left arm on her forehead. 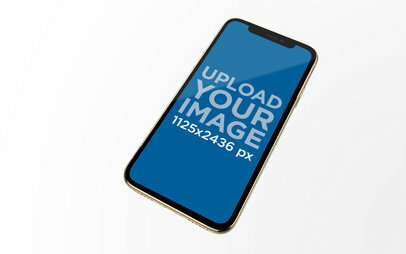 A white iPhone 8 with a shiny golden edge is sitting on a solid brown block. The block, in turn, is laying on a surface of light antique wood. 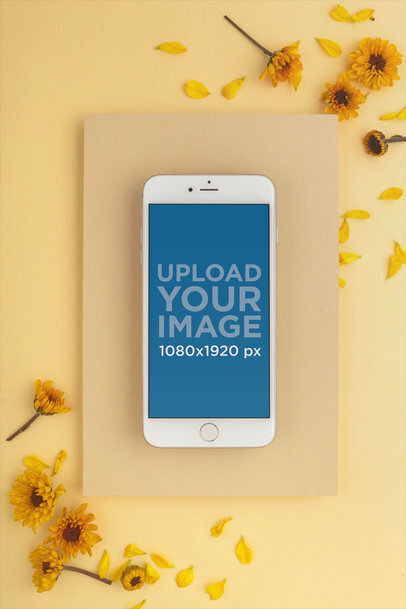 The screen of the iPhone 8 displays a message that says "UPLOAD YOUR IMAGE 1080x1920" in bright, crystal clear words. 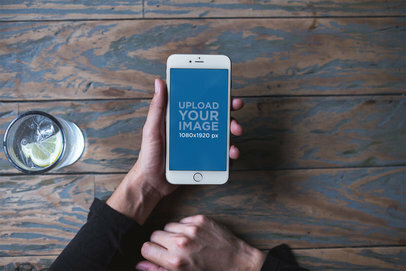 An arm holding a white smartphone. The arm has a red sweatshirt over it. 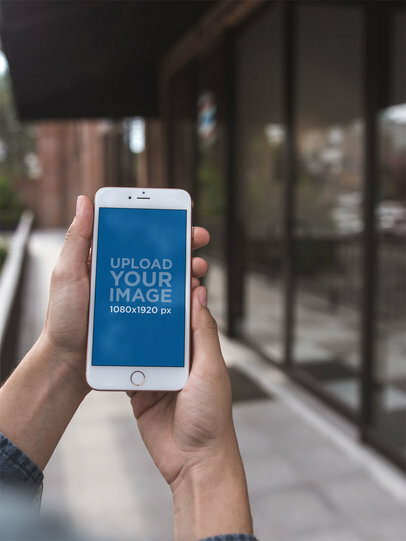 It's holding an iPhone 8 Plus with a blue screen showing its resolution. The phone is tilted a little to the right. 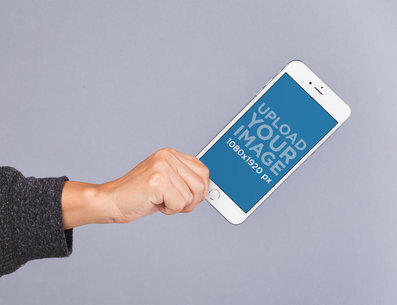 A woman is holding up an iPhone while looking at it. She appears to be an Asian woman with shoulder-length hair. She also has bangs as well. The woman is wearing a knitted, red, long-sleeved sweater. She is holding the iPhone with one hand while her eyes are fixated on it. The background is just all pink with nothing on it or around it. The woman also has a small mole on the side of her face. 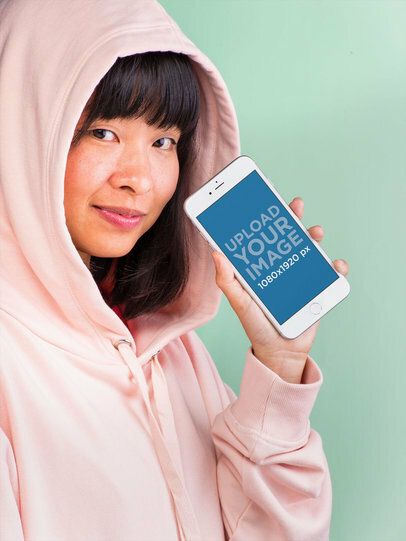 A woman in a sweater is shown holding an iPhone 8 vertically in front of her chest. The image cuts her off at the top and bottom, so it only shows from her wait to her nose. She has shorter hair and is wearing a sweater. She's holding the phone vertically, with the display facing the camera. 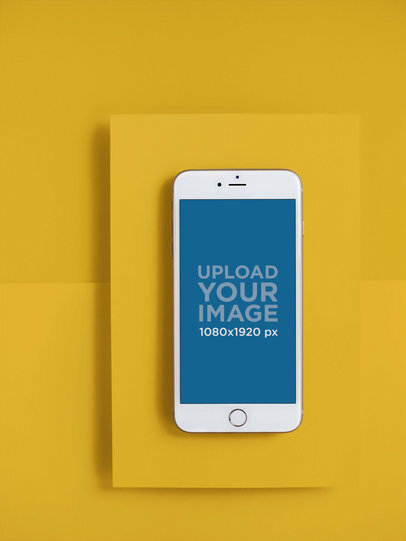 An iPhone 8 rests in the center of the image on top of a proportionally sized but larger orange rectangle. The background is more golden colored. In the bottom left and top right there are gold-colored flowers. There are five in the bottom left and four in the to right. The sizes and positioning vary from flower to flower. There are yellow leaves scattered. 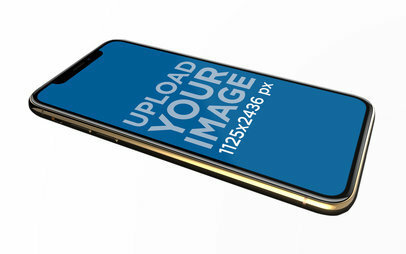 A silver iPhone 8 Plus is centered in the middle of the screen. The iPhone has a blue background. It is on top of a brown sheet. There are white flowers surrounding the smartphone. 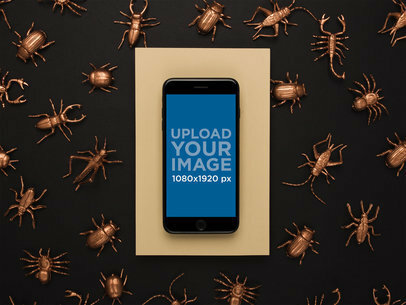 An iPhone 8 is laying on a black background surrounded by several copper colored beetles and scorpions. A Space Gray iPhone 8 Plus is displayed on a box that is sitting on a flat surface. Scattered all around the phone are flower petals. 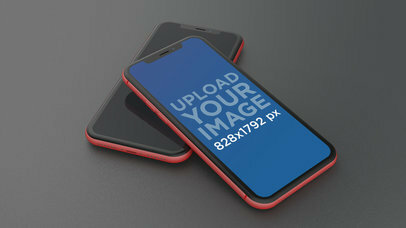 An iPhone 8 is surrounding by a vertical white rectangle. This white rectangle is on a dark green background with a vine of green leaves and several red berries, though they look to be plastic/fake. 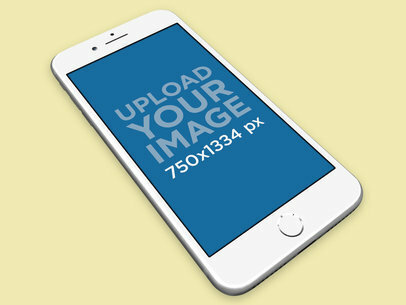 The picture shows an iPhone sitting on a white rectangular surface. The phone looks to be a Space Gray iPhone 8 Plus because of the colors and resolution. It has a black bezel. The home button is located near the bottom with the camera hold on the upper part. There is some sort of plant that is next to the phone as well. The plant is long and light green. The background is light grey with spots of white. 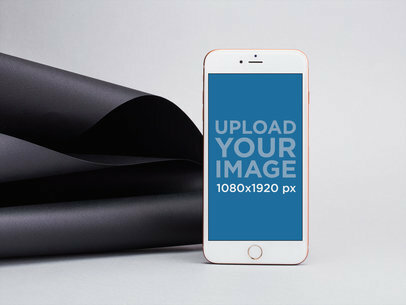 A Space Gray iPhone 8 Plus is lying down on a sheet of paper. 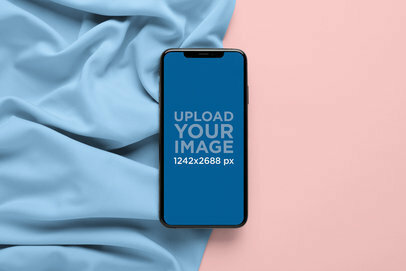 The smartphone has a blue background. The iPhone is surrounded by white flowers. 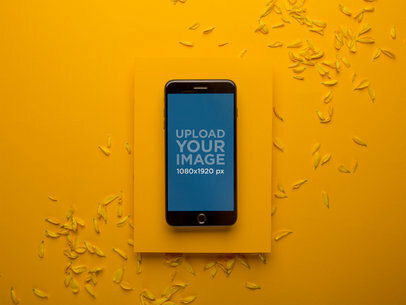 In the center of the image, there is a white box with an iPhone on it. The iPhone box is laying on a light purple background. On the upper left and corner and lower right corner of the box are two small, delicate bunches of light purple hydrangeas. 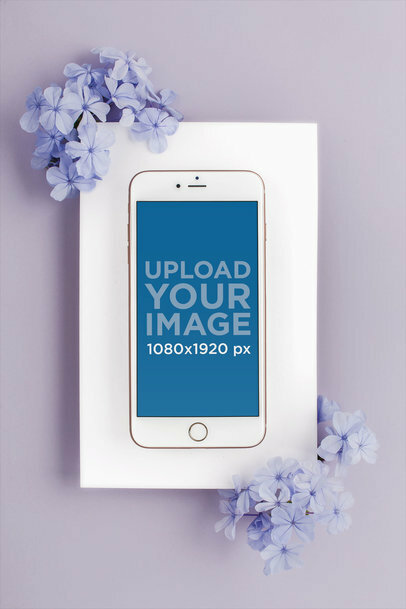 The flowers are framing the corners of the box and they do not extend far enough to cover the photo of the iPhone on the box. 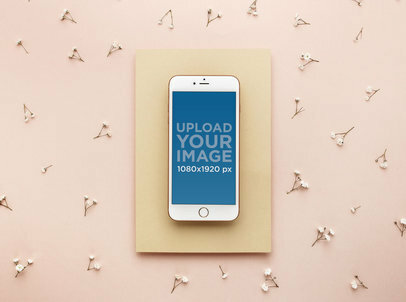 A square tan background upon which sits a square beige piece of cardboard paper. Atop the paper is a Space Gray iPhone. Also on the paper on the bottom right are two brown flowers with stems. 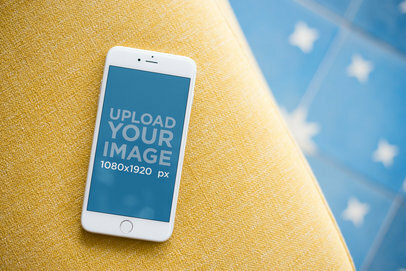 A white iPhone is lying on top of a white sheet. 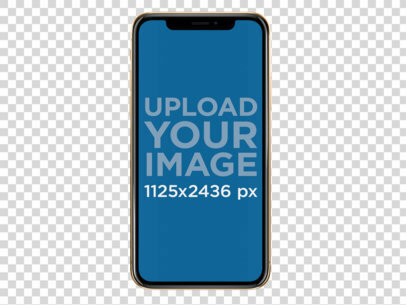 The iPhone 8 has a blue background. 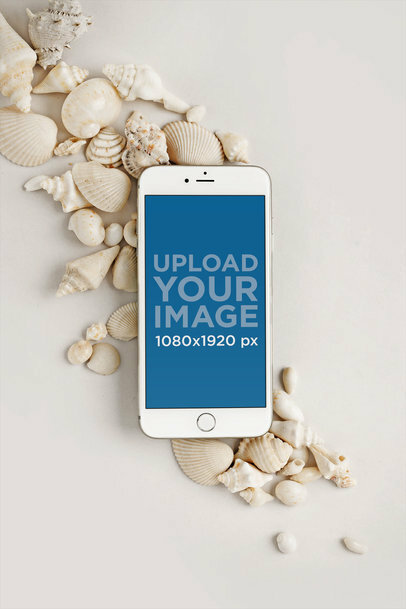 The smartphone is surrounded by seashells. A bunch of sea shells are decoratively place in a forty-five degree angle. There is a iPhone place on top of these shells that has a display that can be changed into different images that the user wants.